Before becoming a successful and professional poker player in 1997, Hansen was a world-class backgammon player and also a youth tennis champion. Hansen always loved sports and he showed that not only by his tennis victories, but also by successfully competing in several other indoor and outdoor sports. In the year 2000 he moved to New York City and tried his luck as a professional backgammon player, but he didn't continue and preferred concentrating on poker. Hansen started his poker career in 1993 at the Ocean View Card Room in Santa Cruz, California, where he played his first poker game while being an exchange student who attended the University of California. He is known as an extremely loose and aggressive player and has a reputation for raising or bluffing with almost anything. This makes the play against Hansen very difficult, and his opponents often call or raise him, not knowing what he holds. Thus, when Hansen holds a legitimate hand, he gets the win and keeps his opponents guessing about his future hands. Hansen had some good poker plays at the World Series of Poker (WSOP) over the years. In 2006 Tournament of Champions, Hansen made it to the final table only to lose on the very first hand. He was holding AK while losing to a pair of 9s. In 2007, Hansen made the money by finishing at 61 out of 6,358 players and won $154,194. In 2008 he finished 160th out of 6,844 players and won $41,816. As for the World Poker Tour (WPT), Hansen is the only player to win three open tournaments and thus holds this record all by himself. He also won the first World Poker Tour Bad Boys of Poker event and in 2008 finished second and won $1,714,800. Aside from the wins and great money, 2004 was a very special year for Gus Hansen as he was inducted into the World Poker Tour Walk of Fame along with the great Doyle Brunson and James Garner. In addition, Hansen won the inaugural $400,000 Poker Superstars Invitational tournament. Gus Hansen is also a proud member of Full Tilt Poker's team of professional players. Television and media are also well known to Hansen as he appeared in The Professional Poker Tour and the second season of High Stakes Poker, where he won one of the biggest pots of all shows, grabbing $575,700. He also appeared in NBC's Poker After Dark and was its first winner, with $120,000. 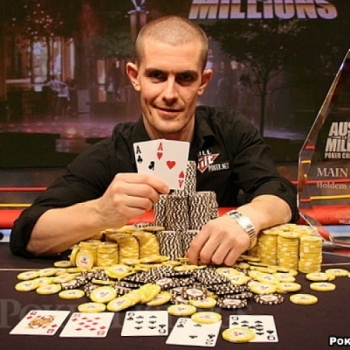 In 2007, Hansen was the winner of the main event at the Aussie millions in Melbourne, Australia. He out lasted 747 other players to win $1,500,000. As of 2008, Hansen won over $7,200,000 in live tournaments only, but he also knew some losses as a professional poker player. Despite his winnings and success, he has struggled with money problems because of losses at live cash games at the Bellagio Casino in Las Vegas. He admitted to losing a million dollar or so at a couple of games. The fact that he enjoys betting does not help as he also admitted to losing money at sports betting. In 2005, Hansen took part in the "Going All In" instructional series of DVDs and appeared in "Texas Hold'em Poker Advanced Strategies With Gus Hansen". He also published a book in 2008 called Every Hand Revealed. He was one of the founders of a successful online poker, which was later purchased by the online betting giant, Betfair.